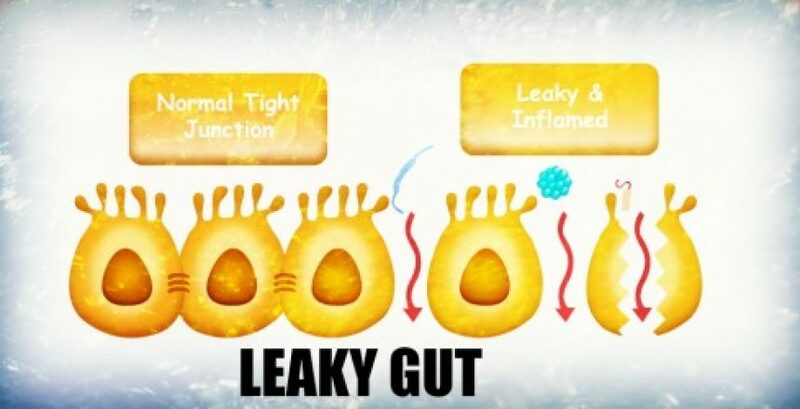 Leaky gut is a term used as a simple explanation for increased intestinal permeability. Imagine your intestines as a long hose. If the hose is not damaged, then water will move freely through one end and out the other side. Now, imagine that same hose with tiny punctures. The water now leaks out before reaching its intended destination. Leaky Gut Syndrome is similar to a damaged hose, as particles can leak out into the body where they shouldn’t be. This causes damage and dysfunction resulting in poor health. Your intestines are designed to act as a natural and selective barrier allowing nutrients in while keeping foreign objects from entering and reaching the blood supply. With leaky gut, there is damage to this natural barrier, exposing our body’s immune system to objects it normally isn’t exposed to. The natural barrier is called a tight junction and with leaky gut, tight junctions fail. Your tight junction is what keeps out toxins, microbes, and undigested food particles from reaching the blood stream. A healthy functioning intestinal mucosa is the body’s primary line of defense against these potentially lethal agent. 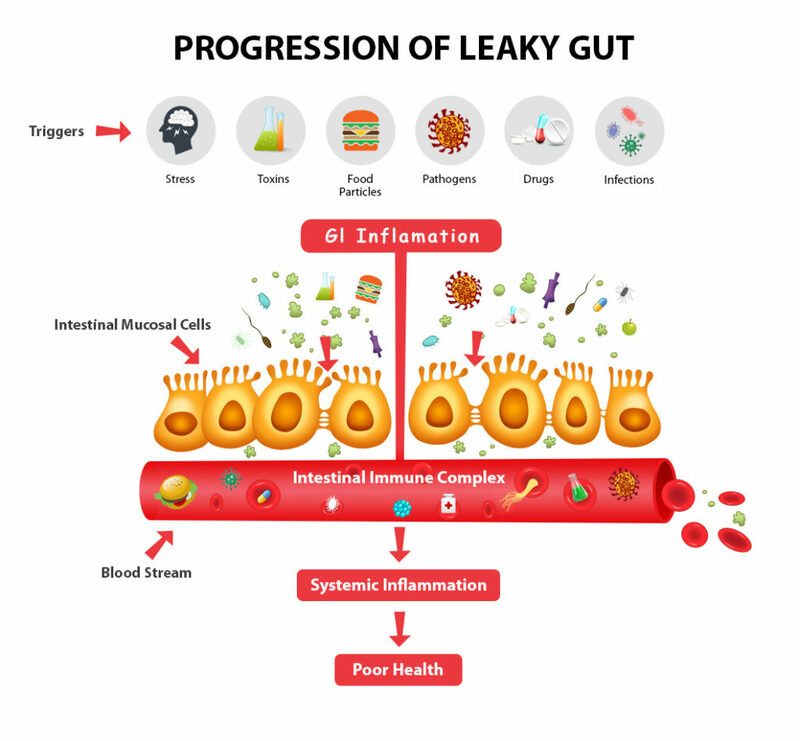 As more individuals are affected by poor dietary choices, toxin and chemical exposure, high levels of stress, and dysbiosis (bacteria imbalance), it seems that the prevalence of leaky gut has increased significantly. Good news is that the medical community is finally agreeing this condition exist, so hopefully more research will be available soon. Currently there is plenty of research that links leaky gut to a number of health problems. It’s important to note; it’s rarely one trigger that causes leaky gut. It’s an accumulation of some factors, over time, that attributes to leaky gut syndrome. Leaky Gut Syndrome can express itself many ways, which is why it’s missed by health care professionals. Currently there is plenty of research that links leaky gut to a number of seemingly unrelated health issues and chronic diseases, and not just digestive disorders which is a common misconception. Numerous studies link leaky gut to intestinal inflammation, oxidative stress, and depletion of vital micro-nutrients. Addressing these causes will benefit individuals suffering with leaky gut. Here are 3 tips that can help. Quercetin is an antioxidant and also acts as a natural anti-inflammatory. Studies have shown to enhance intestinal barrier function and with intestinal inflammation. L-Glutamine is an important energy source for cells of the intestinal mucosa and has been shown to be important for normal mucosal structure and function. Zinc deficiency has been shown to cause disruption in mucosal barrier function and inflammation.